This is a update for Dec. 6-10 and 13-14. Much work has been done on the Gorgosaurus, in fact so much there is little left to do on this side of the block. Virtually all the bones that there are to be found have now been found. New bones since the last update are the pelvis and the base of the tail which only consists of two vertebrae and three chevrons. A meeting was held on December 14th to decide how and what to prepare in the future. 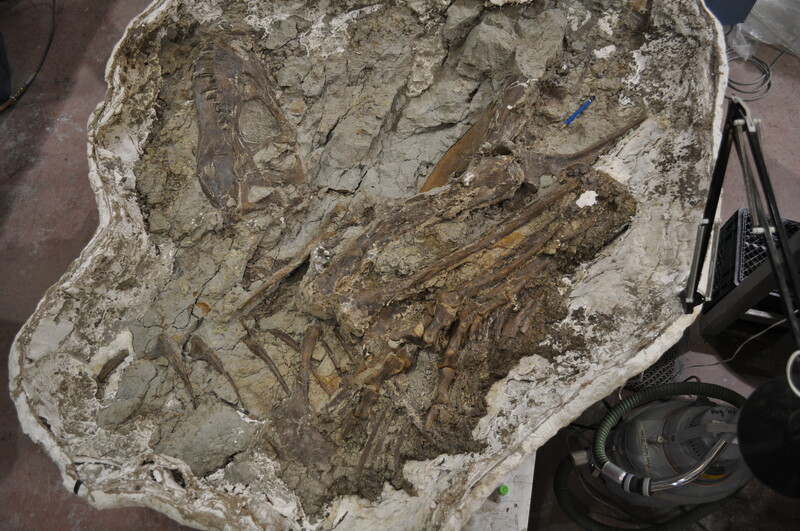 It was also decided that this side of the Gorgosaurus will be moulded in latex rubber, the mould removed and then a new support jacket made before the block is turned over and preparation begin anew on the other (top) side. Right now I am mostly dealing with what is called “fine preparation” or “super detailing”. This work is the final stage of preparation. All the bone surfaces are gone over visually and with a finger to find (and feel) the last vestiges of rock or clay stuck to the bones. Small brushes and damp sponges can remove the last bits of clay. Sutures or contacts between multiple bones are highlighted by removing as much rock as is safely possible along their edges. Any repairs are mended. All holes and cracks are patched and filled. Old glue, now often contaminated with sand grains is carefully scraped off and redone as/if necessary. Rock itself is glued or reglued as needed and in places where the rock crumbled away creating seep undercuts, those areas are filled in with epoxy putty or plaster, then textured with an airscribe to look like rock. All this work will take several weeks to accomplish. As the specimen will be moulded, it is important that the bones and rock be solidified as the removal of the latex mould can cause breakage. This breakage inevitably occurs, but all efforts are made to find potential problem areas and deal with them now, rather than have to deal with broken bones later. Postings here will be slower now and likely show the specimen overall instead of featuring certain areas. The pictures here were taken on December 14 with a new higher quality camera and different lighting conditions so they appear much different than prior ones. Been hanging out for an update. Thanks Darren! You prob mentioned this in earlier posts but I had a look and couldn’t find it. 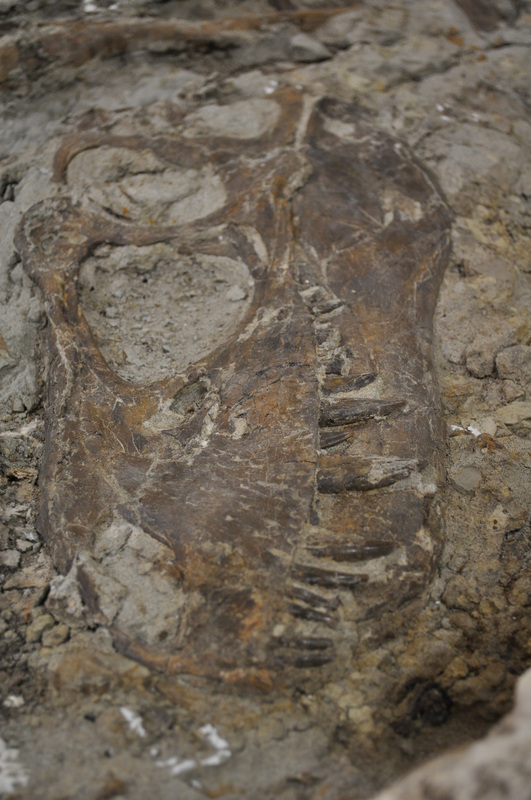 I assume from the look of the skull (DSC_0012 in particular) that this is not an adult specimen. Are you able to provide an estimate of its age at death and (presuming you aren’t able to determine a narrow range for the estimate) will someone be slicing a bone to count growth rings? 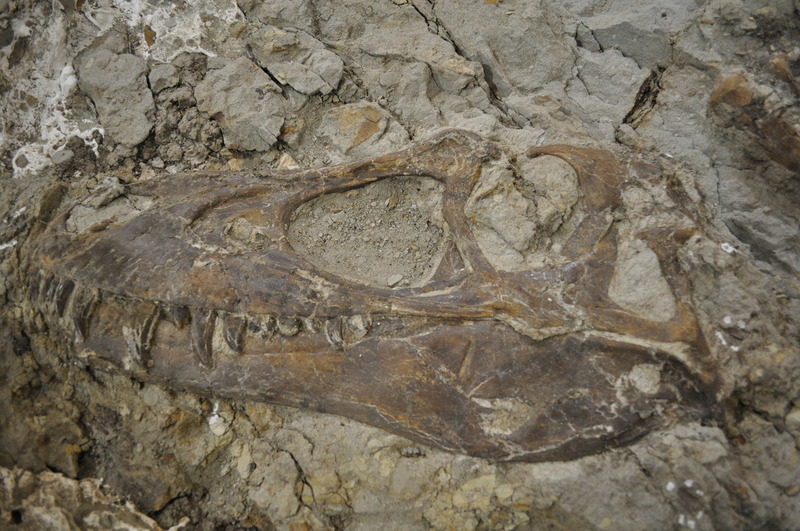 It is believed to be the smallest relatively complete and articulated Gorgosaurus skull known. Regarding the age of the individual when it died, this has not ben determined and there are no plans at present to slice a bone for a ring count. Now that the specimen nears completion on this side, we can see what various lines of research can be pursued. For example, a Tyrrell researcher wants to CT the skull to look at the olfactory bulbs of the braincase and compare same in older animals. He is also interested in jaw biting strength in young vs. older animals. 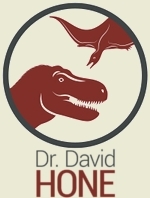 Another Ph.D student is interested in the evolution of large theropod skulls and ontogenetic changes in them. There are other research aspects being considered, but more on them later when preparation of the other side is concluded. There is also discussions now on how we want to display the specimen. It will definately be molded in latex rubber. Getting back to the age of the animal, one could look at the growth curve data for closely related Albertosaurus, but I’m told there are some serious problems with that publication (I don’t know the details). The skull I am working on is about 500 mm long, so small- we think of it as a late juvenile/early subadult phase of its life. Not sure why, but the link provided above takes you to a different picture than the link I copied and pasted here. Follow the link provided above, then click the “previous” button to get a picture of the skull with the scale bar. Ah, that explains it! I was guessing that the scale bar was in/cm and wondering why you didn’t provide a skull-only pic (I clicked the link immediately). Clicking on the pics themselves is the same as clicking “next” so if you copy the link associated with an image, it’s actually a link to the next one. Thanks for these, Darren. I’ll have a look thru the other photos a bit later. With regard to an age estimate, I was loathe to just plot it’s guestimated size on a growth curve given that most of the ones I’ve seen (prob mostly using the same source data) show mass maximums for the various Tyrannosaurids that are substantially less than what seems to be generally accepted. I was thinking that your specimen was perhaps 4-5 years old, but won’t ask you to affirm/refute that unless I’m way wide of the mark.